child care online is delighted to bring you our new selection of downloadable child care forms. Our new Hiring a Nanny Worksheets and Forms were designed to assist parents in the hiring of a qualified In-home Caregiver. These unique resources are economical, powerful and versatile. That's because we put parents in control by giving them unbiased information on every aspect of the hiring process. Best of all, each form can be adapted to suit your particular needs. Available for instant download in MS Word or Excel format, you can edit them to include information pertaining to your family. For those less creative.....just copy and use. Nothing could be easier. A well thought out list of questions is a necessity when interviewing a Nanny. 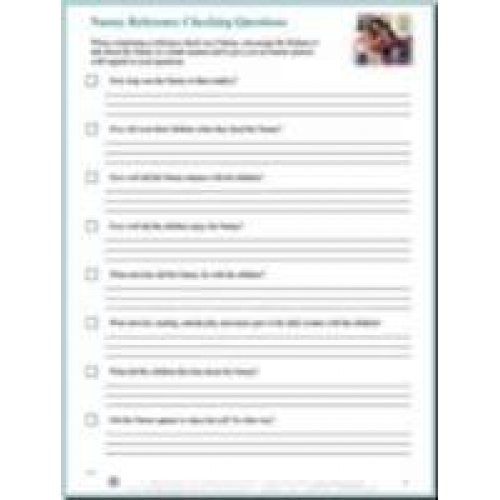 The in-depth list of questions in the Nanny Interview Question Sheet will help you engage the Nanny in detailed conversation about her professional and personal background. Covers a lot of questions you may not think to ask yet are vitally important to weeding out a quality caregiver from a poor one. ***Note: Image has been blurred to protect the form's copyright.